MORE than 30 bags of rubbish were collected as part of the 1st Knaphill Scout Group’s January litter pick. Beavers, Cubs, Scouts, leaders and parents turned out to support what has become an annual event in the Scout Group calendar. As well as the usual litter, the clean-up team also removed a discarded TV, a ride-on kid’s car, a shopping trolley and a couple of hub caps from local streets and parks. 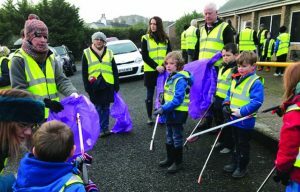 “This is the seventh year we have run a New Year litter pick and I am pleased to say generally the streets of Knaphill were less littered than previous years,” said Group Scout Leader Tracey Daniell. “All were keen to use their litter pickers and keen to compete to see what unusual rubbish they could find. Several passers-by commented on what a good job the young people were doing and how cheerful and polite they were.